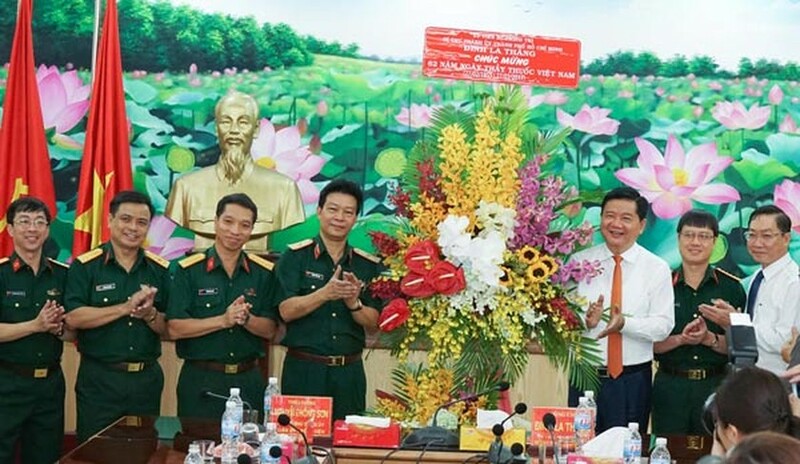 On the occasion of Vietnam Doctors’ Day, Party Chief in Ho Chi Minh City Dinh La Thang yesterday visited and congratulated medical workers in the hospital 175- under the Ministry of Defense. At the meeting, Major General Hospital Director Dr. Nguyen Hong Son said that staffs of the infirmary have made concerted efforts to provide good treatment services in land as well as in island; training and making researches to improve treatment quality for years. So far, the hospital receives around 2,500 patients a day. Additionally, it has provided training to medical workers and partake in social activities. Highly appreciated the hospital’s achievement 175, Party Chief Thang expected the hospital staffs will coordinate with other infirmaries in the city to take care of people’s health. On the same day, Party Chief Thang cut the ribbon to open the second hospital in Go Vap District at 641 Quang Trung Street. 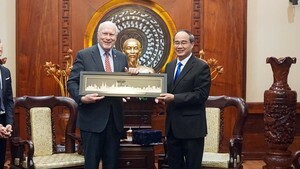 The 13,340 square meter infirmary has 300 beds, 22 wards totally worth over VND470 billion. Director Pham Huu Quoc said that so far the hospital has carried out 2,934 techniques including endoscopy to reduce stone in ureter to powder by laser, carpal tunnel syndrome, hemodialysis. Director of the municipal Department of Health Nguyen Tan Binh said that the second infirmary has helped to reduce the overloading for big hospitals accordingly improve healthcare task. Later, Mr. Thang visited and congratulated staffs of the Hospital of Tropical Disease, Preventive Medicine Department, Maxillo-Facial And Dental, and Tumor Hospital.